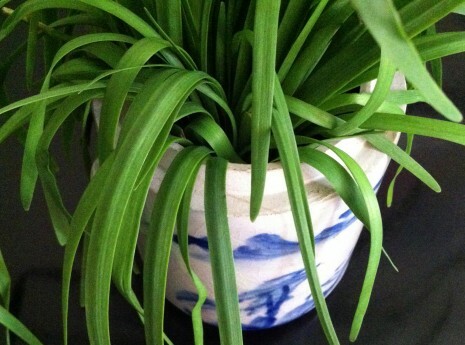 GARLIC CHIVES: A MARKET STORY | Jane Lear. Writing on Food and Travel. I cantered around the Union Square market on Saturday like I was warming up for the Preakness. I came to a screeching halt, though, at the tented tables staffed by Lani’s Farm, from south Jersey. Something smelled really, really good. Sure enough, I found Eugena Yoo (who manages the farm with her brother, Steve Yoo) behind a hot plate, making what seemed to be a big, thin crêpe. “What is that?” asked someone in the interested knot of people around her. “Garlic chive pancake,” she replied. “Just flour and water, a little salt ….” She held up the pancake and started cutting it into pieces with scissors. Everyone else hung around for a taste, but I wasn’t born yesterday. I grabbed a few bundles of the chives and made it to the cash register before it was mobbed. Garlic chives (aka Chinese chives, gul choy, gao choy, and Allium tuberosum) are native to central and northern Asia. Unlike “regular” chives, which are tubular, garlic chives are flat. Most often, you’ll see green ones, like those above, but sometimes they come topped with small buds or they are blanched—that is, grown under cover—so that they’re a delicate, expensive pale yellow. Green garlic chives are what you use to season a new carbon-steel wok (“Nothing removes that metallic taste like Chinese chives,” stir-frying authority Grace Young once told me), and they’re popular in stir-fries and noodle soups. Cooking them any which way, in fact, mutes their garlicky edge and reveals a tender, vegetal sweetness. Steamed or sautéed and sauced with gingered butter, garlic chives make a quick side for seared scallops or fish. They are also lovely in an omelet or soft-scrambled eggs, and a smear of the Korean chile paste gochujang—one of my all-time favorite condiments—takes things right over the top. Now, about chive pancakes. By the time I got home from the farmers market, I was starving and not in the mood to crack open a cookbook, let alone get sucked into a recipe search online. So I washed a handful of the chives, patted them dry, and cut them into pieces about two inches long. Then I stirred together a half cup flour and a half cup cold water, pressing out any lumps, just until it was smooth, and folded in some of the chives. I skim-coated a nonstick skillet with safflower oil, and when it was hot, poured in some batter and spread it as thin as possible (note to self: spread faster next time). Drat! I’d forgotten the salt, so sprinkled some on top of the pancake. After about two minutes, I peeked at the underside, which was turning golden brown. I gave it another 30 seconds or so to get good and crisp around the edges and turned it over with my fingers. I added a smidgen more oil and waited a few more minutes, pressing every so often with a spatula so that the other side browned evenly. The kitchen smelled delicious. Well, my pancake wasn’t as thin or as big as Eugena’s was, but not too shabby for a first try. While the second one was working, I dug the gochujang out of the fridge. And then I ate breakfast standing over the stove. I’ve been growing garlic chives for decades–they almost grow like weeds here in MD. I never realized they were Asian in origin or realized they were aka as Chinese chives. I stuff huge handfuls into vinegar (including the blooms) that after steeping then goes into vinaigrettes. And I use them in place of onions in soups and stews, but you’ve given me some great new ideas. Thanks for a really helpful, informative post. Vinegar! You have rocked my world. Thanks so much for writing….